Well, I’ve cut out my Marfy 1313 dress from a of a mid-weight washed linen, sort of blushy coloured. But I decided the bemberg lining I had in my stash wasn’t going to add the anti-wrinkle support this dress needs so it doesn’t bag out of shape while wearing. So I went to ThaiSilks.com and ordered habotai, and now I have to wait for it to arrive before I jump into this project. It’s kinda funny how a use-up-stuff-from-my-stash-only project always ends up with additional expenses that technically make it not a stash-only venture. And it’s also kinda funny (in a most annoying way) how no fabric shop in the entire fashion district carries any china silk in colours other than black, ivory or white. So, in the meantime, I’ve kept myself busy with another Donna Karan pattern – Vogue 1093. No changes or creativity – just as close as possible to the picture on the pattern. the top of the vent for the sleeve cuff. the pocket facing and point-edge that you can see centre-front of the buttons. The buttons actually help hold in place two pleats that form the fullness of the pocket. This took some time to put together. 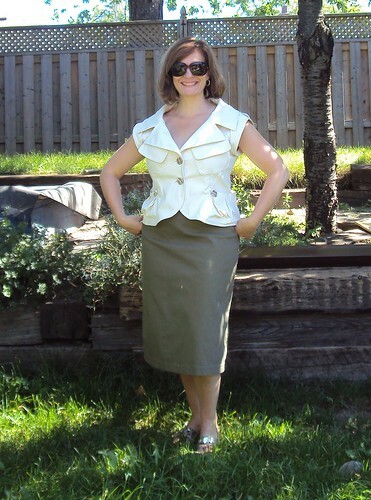 The skirt went together in about 2 hours, but the jacket took me about 3 afternoons. I must say I was really pleased with the collar – it’s drafted really well and rolls be-yew-ti-fully – just the way a big dramatic collar should roll. *Gasp* I forgot I had this in my stash. It is going to be one of the first garments I make next Spring. I only hope it looks as good as your does!